Last month we discussed traveling with Fido and Meow-man, which naturally led me to thinking about pet emergencies. They can come out of the blue when you least expect it, so you need to be ready to seek medical attention for your four-legged family member. Let’s look at some options for readiness at home, and when your away on vacation. 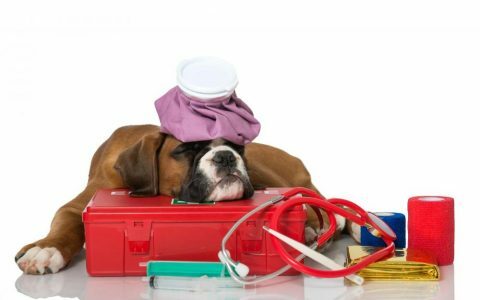 FIRST AID KIT (for home and travel): Although we briefly covered this last month, it is worth mentioning again as it can be a time saver when determining when or if your pet requires urgent care. A kit should include: a soft, flexible thermometer and a clear gel for insertion, (check with your veterinarian for your pet’s normal temperature range and instructions for use), a styptic pen or powder to stop toenail bleeding, saline solution or eye wash to flush wounds, gauze, bandages, self-adhering wound wrap tape, flea/tick shampoo, towels, tweezers for removing ticks, pet appropriate cleansing wipes, medication if needed, and anything else your pet may require. Keep these items safely secured in a plastic container or box. Whole-Dog-Journal.com suggests always having the following items ready in addition to your first aid kit: comfy blankets, clean towels, a flower remedy like *Rescue Remedy – Pets which is a calming aid for shock, and anxiety. You should also include pure or distilled water, measuring cups, an eyedropper, and hydrogen peroxide for cleansing wounds, and an animal appropriate salve for wounds. Check the Whole-Dog-Journal website for access to many helpful articles and consider signing up for their free newsletter. Another great website is Dogster.com. Their magazine is fun to read, too. Our March blog also suggested keeping a grab-n-go bag ready for travel that includes a first aid kit, or you can keep a travel bag in the vehicle as I do, so whenever your out and about, a first aid kit and other supplies are always with you. In addition, my bag includes a collapsible bowl and commercial bottled water, poop bags, treats, extra leashes and harnesses, Benadryl for allergic reactions, paper towel and wet-wipes for quick clean-ups. EMERGENCY CONTACT INFORMATION: In addition to your first aid kit, you should already have your veterinarian’s phone number and emergency pager numbers in your Contacts list of your cell phone, posted on the refrigerator and taped to the lid of the plastic first aid box. By having these critical numbers immediately available for you or a family member, help is quickly accessed and you have reassurance when an urgent care need arises. Also, if your veterinarian does not have after-hours emergency access, you will be directed to call the nearest animal emergency hospital. If you do not already have this information, you can do a Google search for the nearest facility in your area. Please log this information alongside your veterinarian information. You can remember your veterinarian’s name, but it is easy to forget the name of the emergency animal hospital, so having this under the vet’s information will save you time and frustration. When faced with urgent decisions, you really don’t want to waste time doing a Google search, or rely on Alexa to find a good doctor for you. iHeartDogs.com offer several items to help keep Fido safe including an Emergency Contact Information magnet, a laminated Toxic Foods refrigerator magnet, window stickers, wallet card and more. Check out their website and sign-up for a free newsletter filled with helpful information. It’s a good resource to know about. PLAN AHEAD WHEN TRAVELING: I would also like to suggest that when you are traveling, you do your homework and locate the nearest veterinarian or animal emergency clinic at your destination, or at your multiple stops along the way. When we are camping with our pets, I research the closest facilities to our destination, check hours of operation, ratings, and amenities offered like boarding or daycare. In the event you or a family member have an emergency, you might need a place for Fido or Meow-man to board for a night or two, or perhaps just a little doggie daycare for a few hours. RECOGNIZING AN EMERGENCY: You may not have encountered an emergency yet, and perhaps you never will, but it’s unlikely. Learning to recognize an emergency is essential when caring for your pet, whether at home or away. A broken leg or an open wound is obviously a critical care event, but it is those insidious infections and internal injuries that are more difficult to recognize. CASE IN POINT: Our Boxer, Mindy, was nearly six years old before we encountered a life threatening situation. Early one morning, Mindy jumped up on the bed, which was unusual because she knew she wasn’t allowed on the bed, and snuggled next to me, quivering uncontrollably. Her body felt extremely warm to the touch, and her tummy seemed painful. Immediately retrieving the thermometer, I discovered my girl had a very high, life threatening temperature. Her normal range was around 100° +/-, however, on this day it was 104° and climbing. Arriving at the emergency animal hospital, they quickly diagnosed her with pancreatitis. She needed immediate treatment. Because they were short staffed and busy, they made her comfortable for transport, and I took her to my regular veterinarian, who, upon just seeing her, grabbed her and ran to the surgical room to begin IV treatment. My girl spent several days in the veterinarian’s care, and even went home with her in the evenings because she needed to keep a very close eye on my girl’s recovery. Mindy recovered fully, and lived a long and happy life. I am thankful I learned to use that thermometer and didn’t assume it was just a tummy ache. Once, when we were camping out-of-state, Mindy had an allergic reaction to an insect bite. She was shaking, panting and restless. Since her temperature was not elevated, I was concerned, but not frantic. Unfortunately, there were no immediate care facilities anywhere nearby, and being this happened late Sunday evening, even my veterinarian back home would be difficult to reach. My first aid kit contained Benadryl, which I gave with strict supervision, even to the point of sleeping next to her during the night to keep her covered with a warm blanket. In the morning, she was fine. It is also critical you do not assume that everything is fine. While there may not be obvious trauma to the outside, internal trauma may be present. Even a light bump from a slow moving vehicle or bicycle can cause major unseen internal damage, or head trauma. Watching for signs like vomiting, lethargy, blood in the urine, bloat, and disorientation that indicate an urgent medical issue. An attentive and responsible pet parent can recognize unusual behavior in their companion. Please do not delay treatment, but seek help immediately, for both your sakes. For more information regarding pet emergencies, please visit PetMD.com, or VetStreet.com for more insightful articles. Emergencies are just that – emergencies. Having supplies ready and crucial information at your fingertips may make the difference in accessing help when Fido or Meow-man needs urgent medical attention. It will also give you a little peace of mind knowing you have a backup plan when the unexpected happens. *NOTE: When using Rescue Remedy-Pets, please be careful when administering it to your pet. It is a very effective resource, but the company does not give a recommended dosage. Until you know how much Fido requires for relief, start with one or two drops for medium to large size dogs, or ask a veterinarian. Check with your doctor for a suggested dosage for small size dogs. Also be very sure to only administer Rescue Remedy-PETS as there are several formulas available for adults and children as well, however, these contain alcohol as one of their ingredients, and alcohol is toxic to animals.